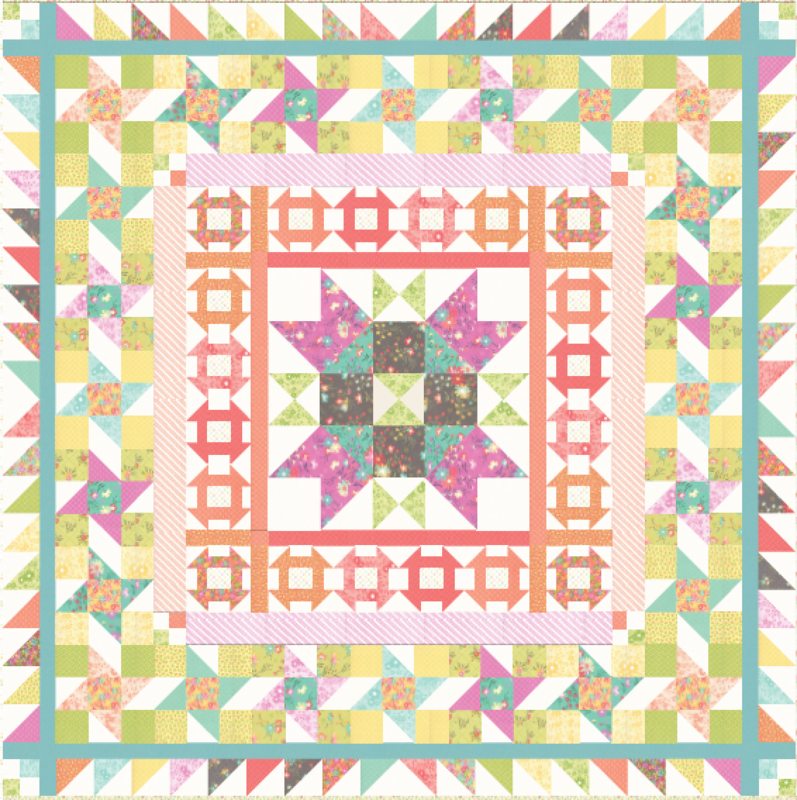 Today we are going make another medallion quilt. 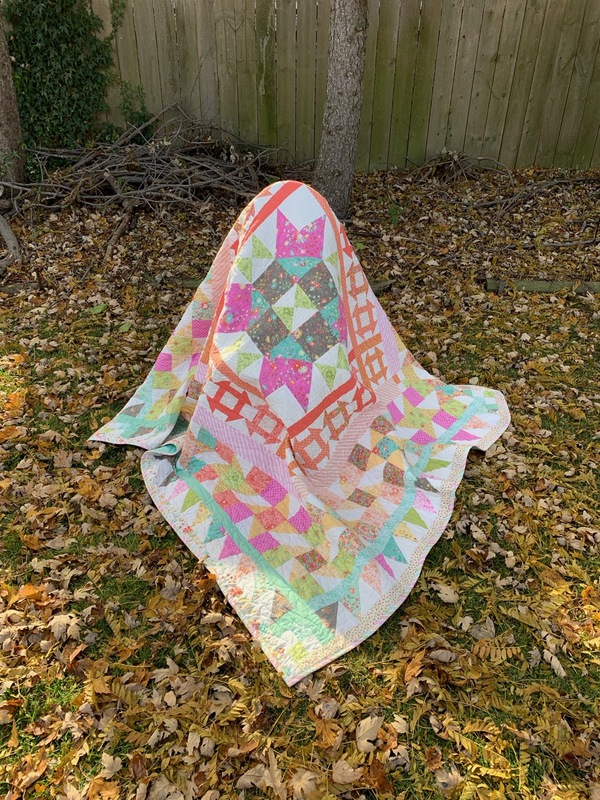 I was privileged enough to sew my quilt with Corey Yoder’s newest line, Sunnyside Up! 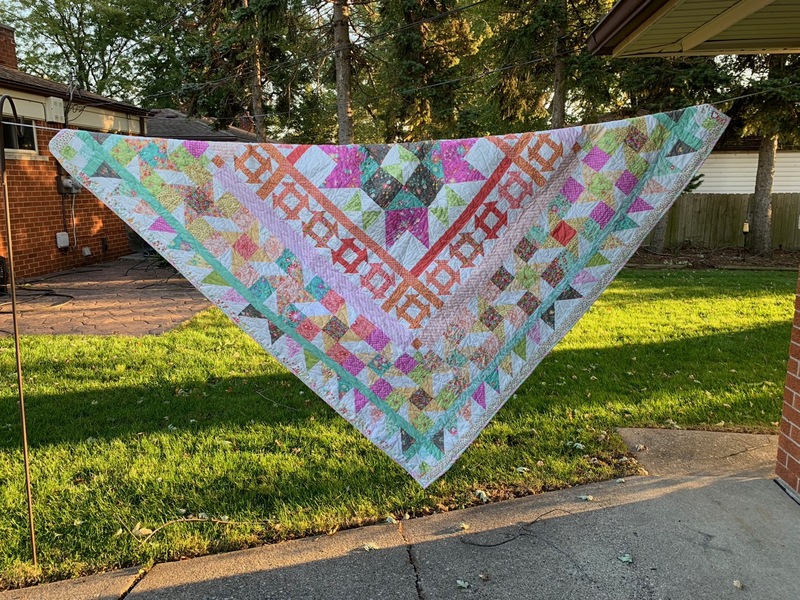 And yes I am one of those crazy quilters who does it all myself including longarm quilting this beauty myself. 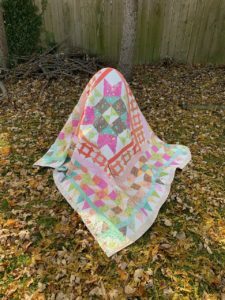 This quilt/project finishes at 76″ x 76″. A very helpful tool, while making this quilt is a good square ruler to trim the quarter square triangles and half square triangles. 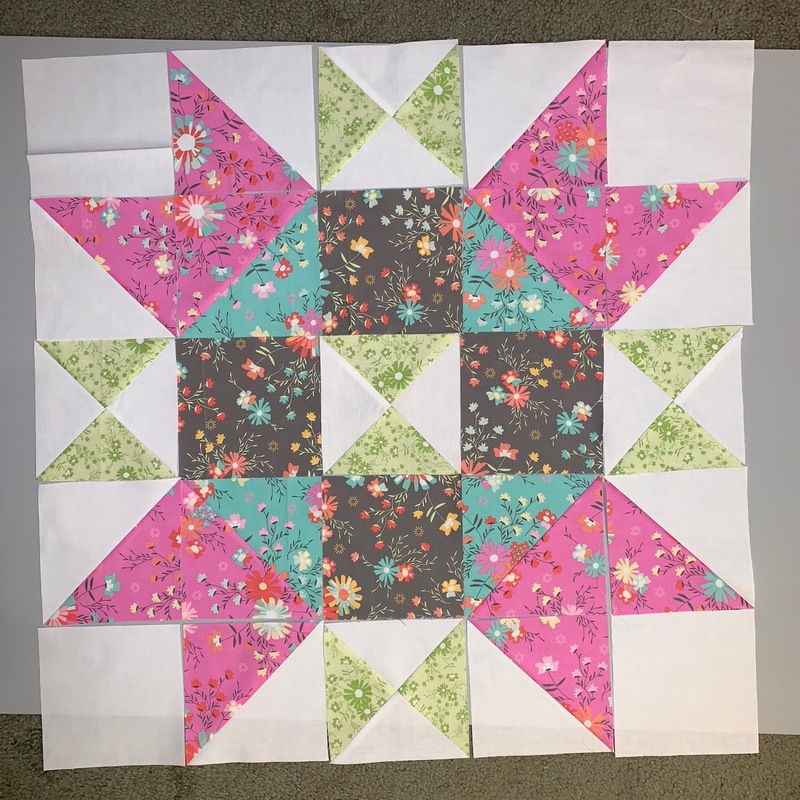 The center block finishes at 24 inches square. 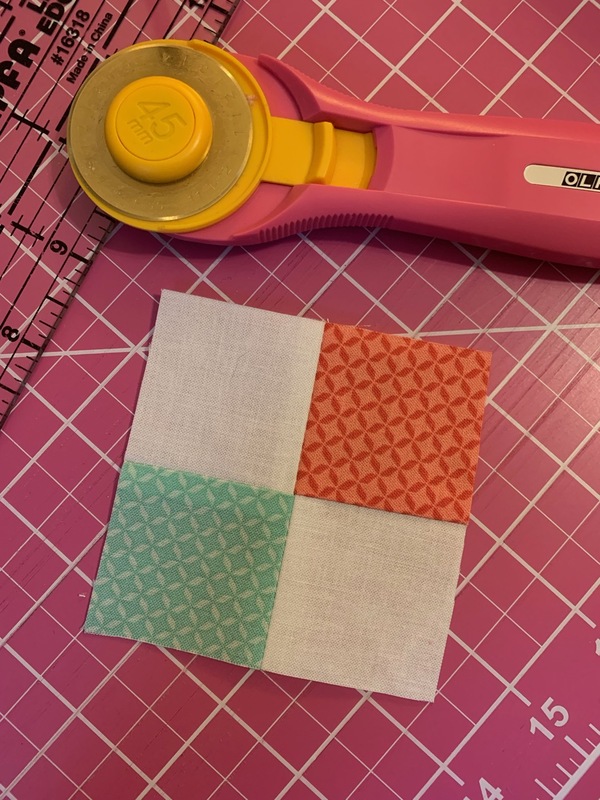 First make your QSTs with the 6 inch squares of background and green print. 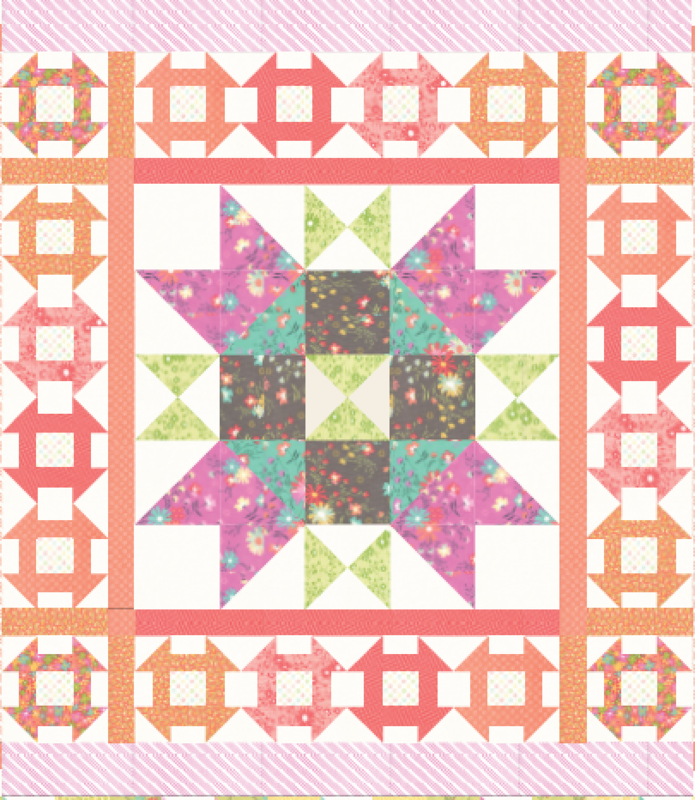 You will need 5 QST’s for the center block, therefore you will end up with on extra. 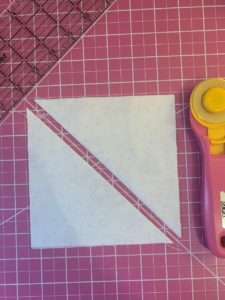 Draw a diagonal line on the back of your back ground fabric. Place the two HSTs on top of one another, right sides together with the green on top of the white. 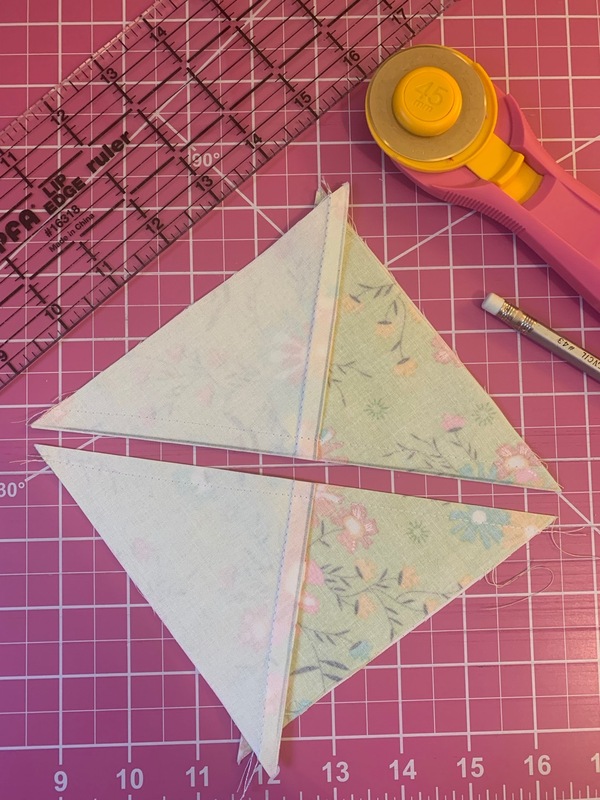 Note: my dear friend and fellow chef, Christine Weld, has a wonderful building blocks tutorial on making quarter square triangles here. You will need to make 8 HSTs with pink print and background and 4 HST with pink print and aqua print. Trim to 5 ¼ inch square. 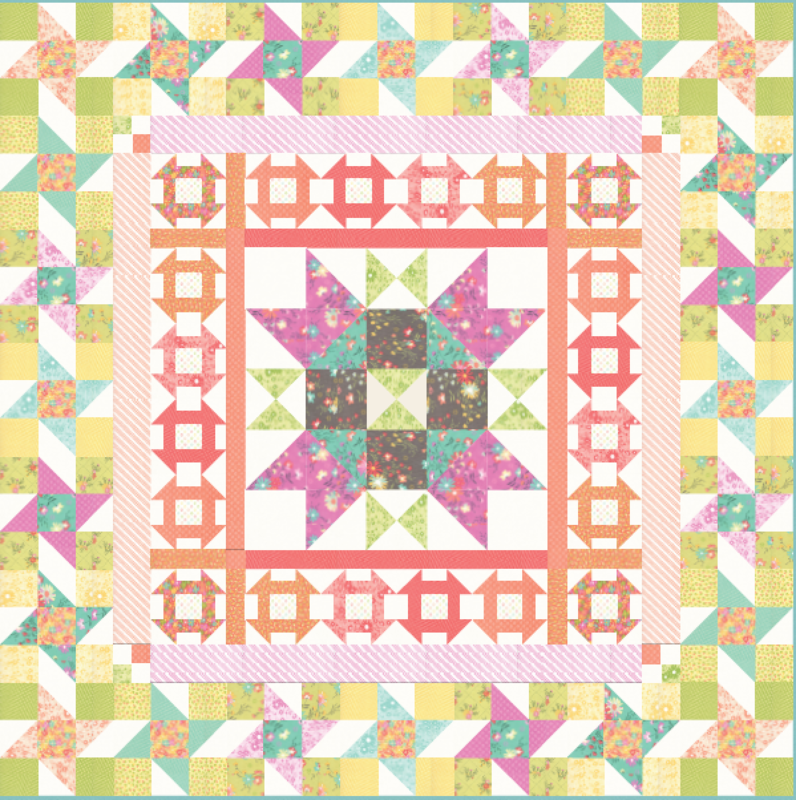 Your block should measure 24 ½ inches square. 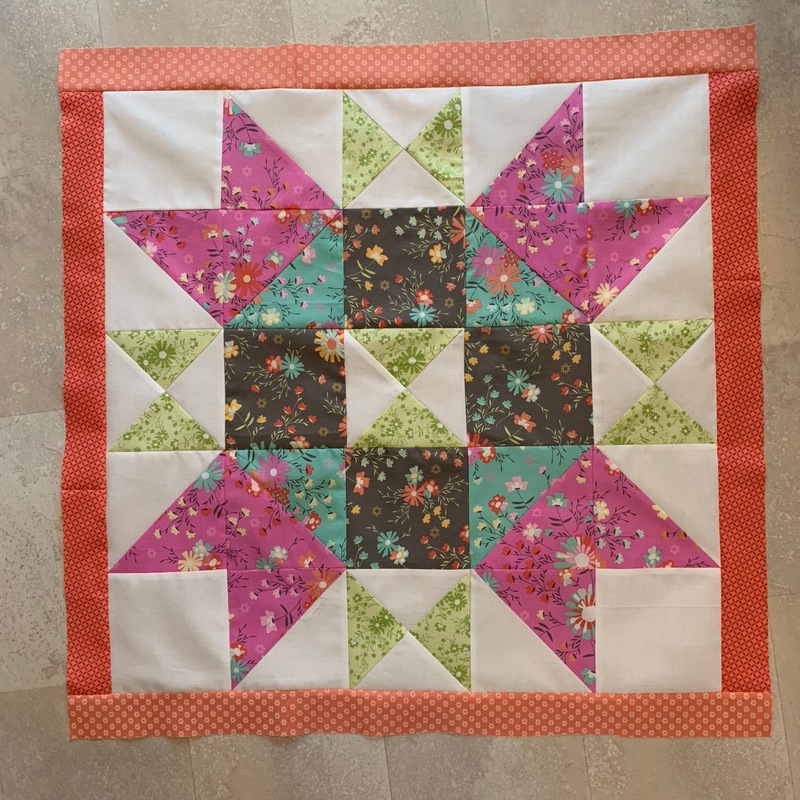 Let’s next place a border around the center star. 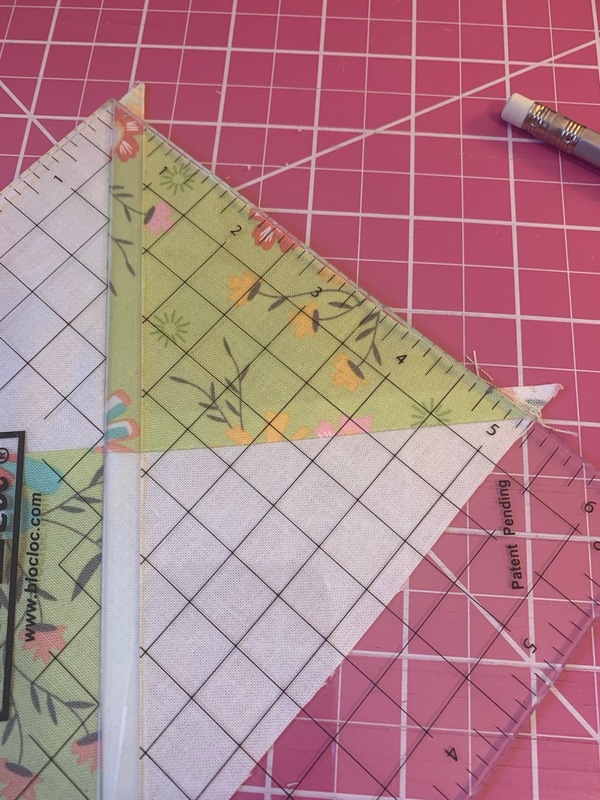 Note you may need to piece together the strips from your fat quarter pieces of fabric. 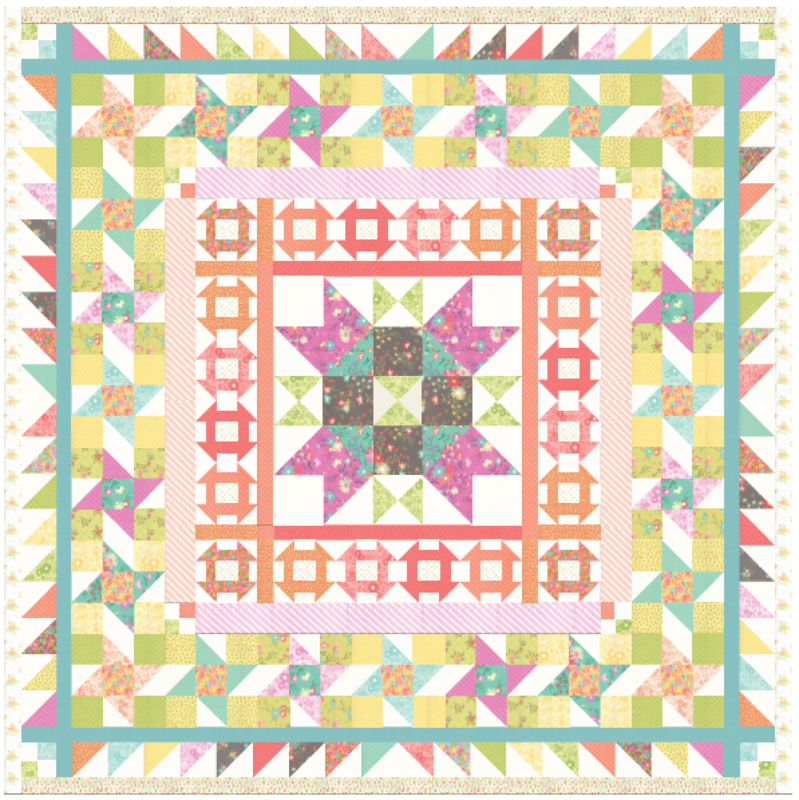 Sew one 24 1.2 inch piece on the top and bottom of the center star, press toward the border. 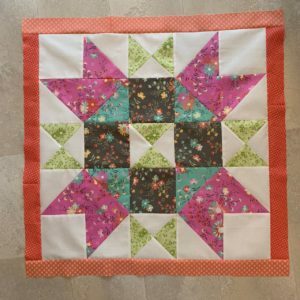 Sew one 27 ½ inch strip on each side of the center star and press toward the border. 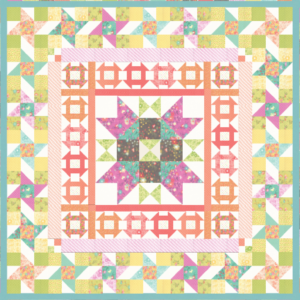 Your quilt should now measure 27 ½ inches square. 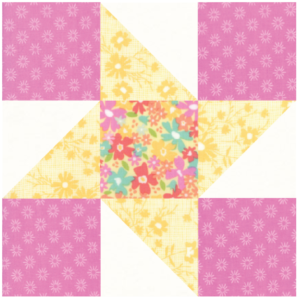 Select 4 blocks and sew together in a row, sew a 2 x 6 ½ inch peach print rectangle at each end of the row, and press seams open. 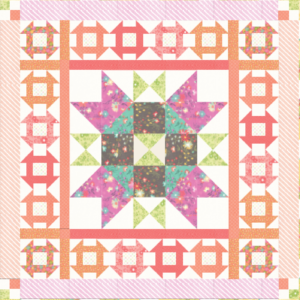 The row of Churn Dash block should measure 27 ½ inches long. 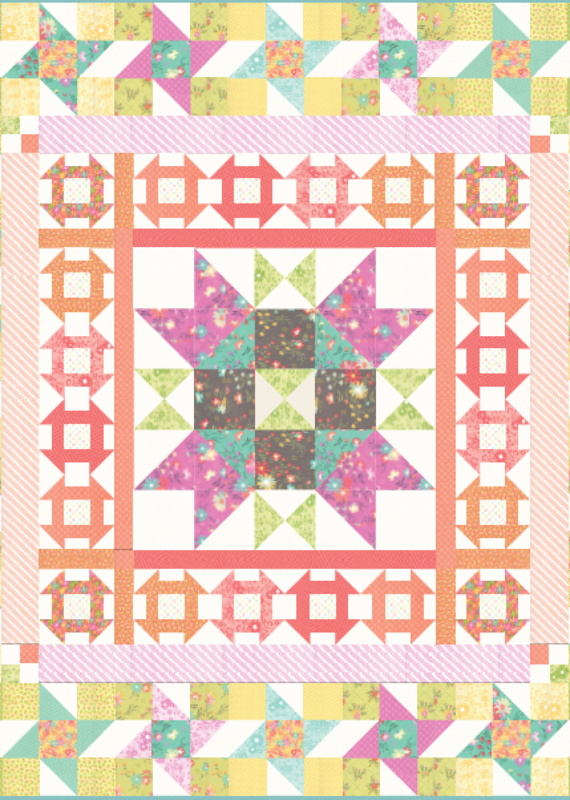 Sew the row of 4 Churn Dash blocks to the top of your center star with borders. 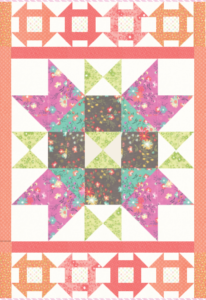 Repeat and sew another row of 4 Churn Dash along the bottom of the center star with borders. 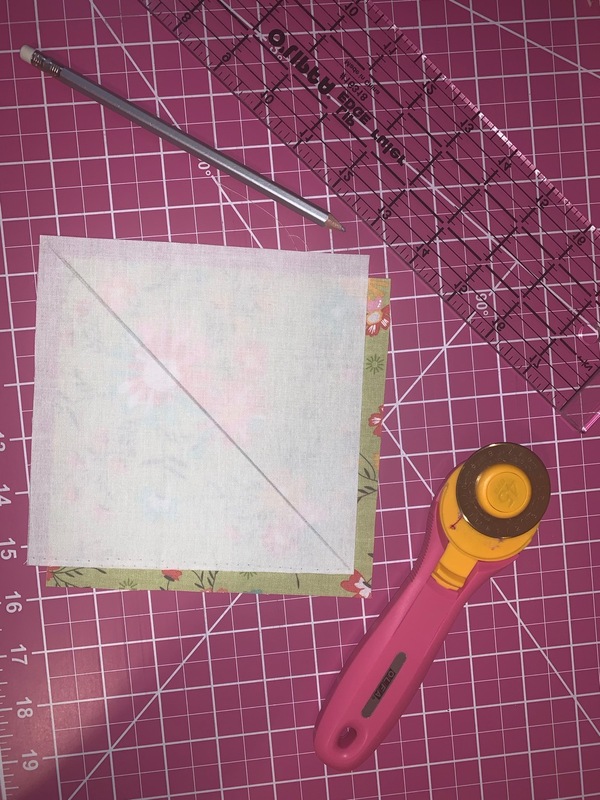 Press toward the border. 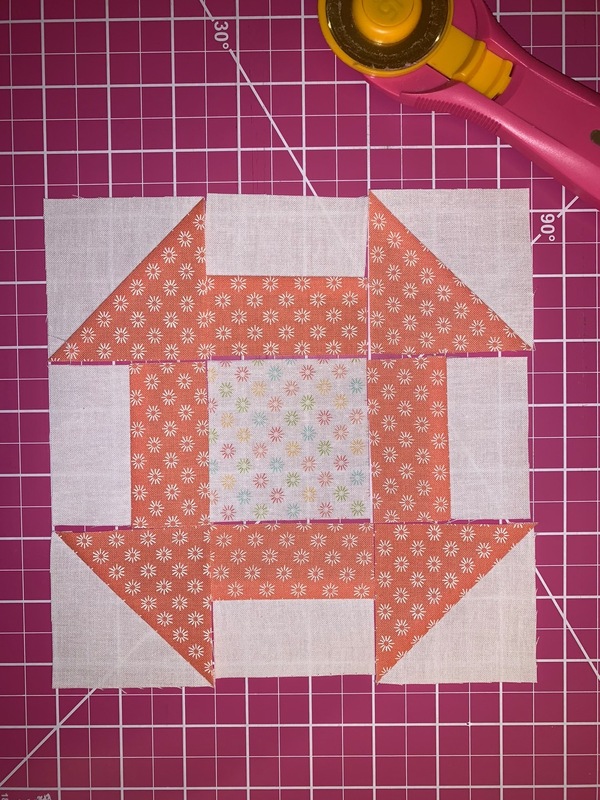 Repeat and sew a row to each side of your quilt. 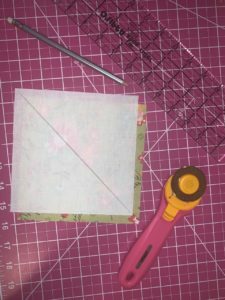 Press toward the border. 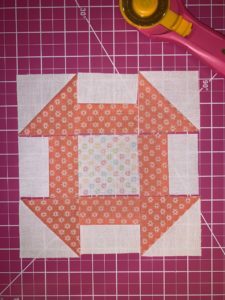 Next you will make our second border’s Four Patch corner stones. 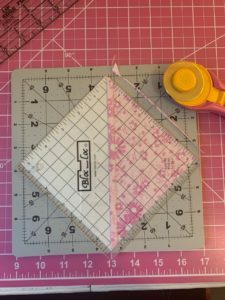 You will be making 4 – Four Patch cornerstones that measure 3 ½ inches square (3 inch square finished). 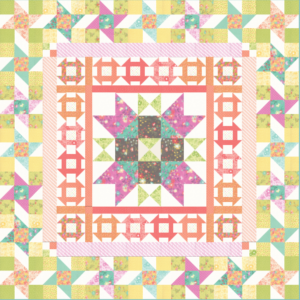 Sew a 39 ½ x 3 ½ inch rectangle of the Pink Bias Gingham Stripe Fabric to the top and bottom of the quilt. 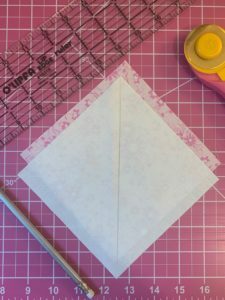 Press seam toward the border. 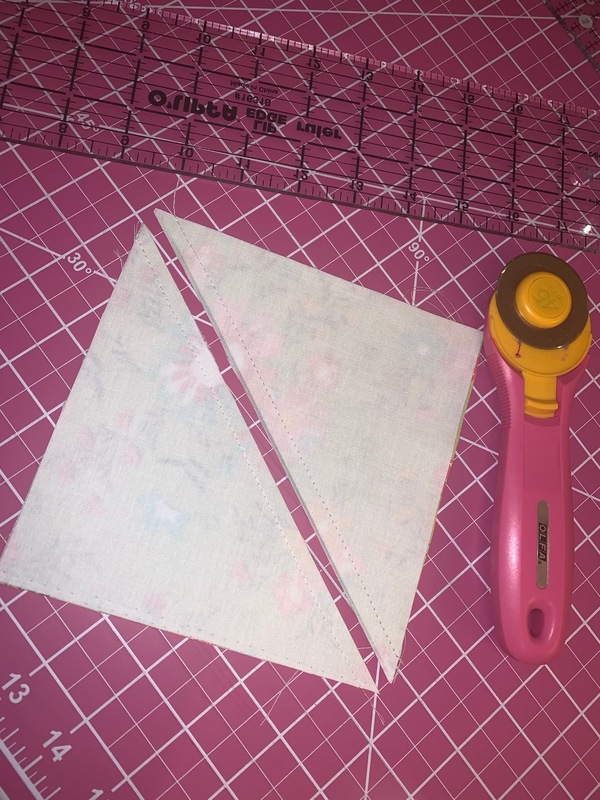 Sew the peach strip with cornerstones to the sides of the quilt. 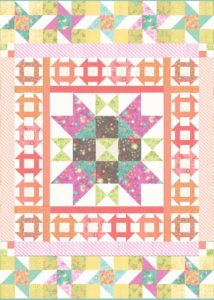 If desired try and place the peach corners of the cornerstones inward toward the center of the quilt. 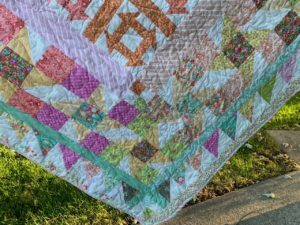 Press seams toward the border. 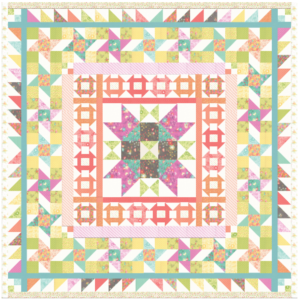 96 – 3 ½ inch squares of various prints for the corners of the Friendship Stars (I cut my corners in sets of 4 of the same print) . 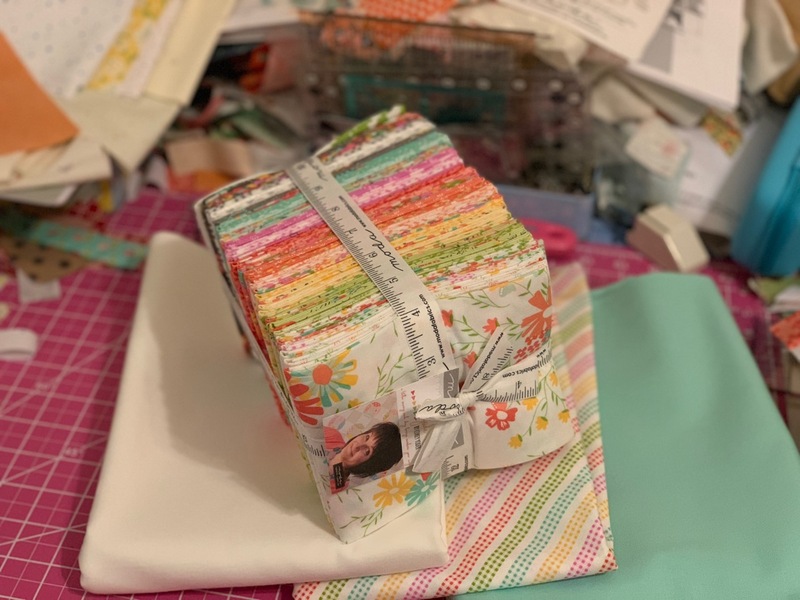 Make 96 HSTs with the 48 – 4 inch squares of background fabric and the 48 – 4 inch squares of various prints. 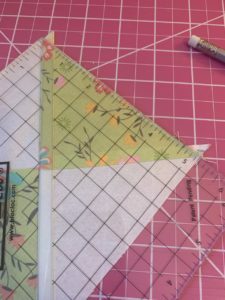 (HST directions as shown in Section 1 – The Center Star). 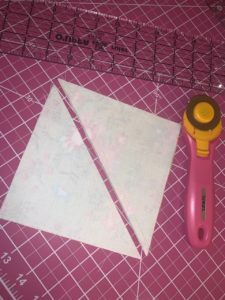 Trim the HST to 3/12 inches. 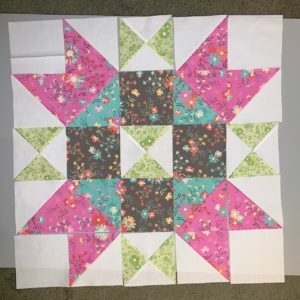 Once all of the Friendship Stars are together select two groups of five block, sew them together into two separate rows of 5 blocks each, and press seams as desired. 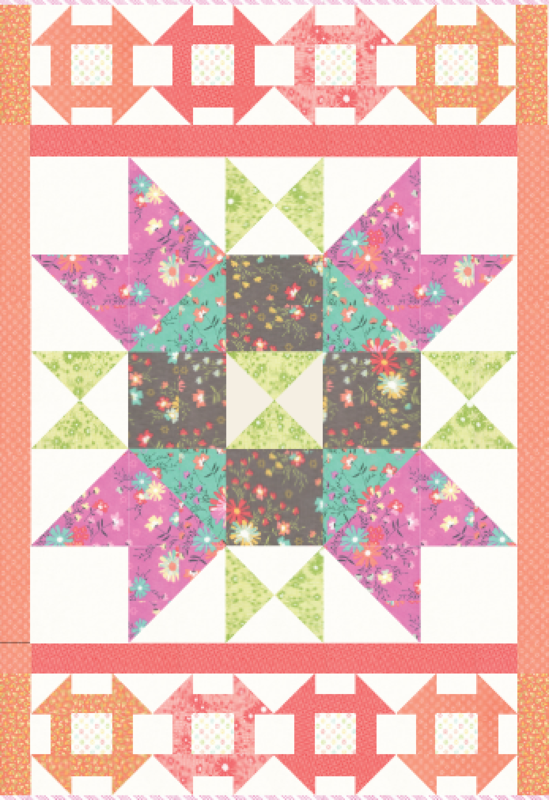 Sew each row of 5 Friendship Stars to the top and bottom of the quilt. 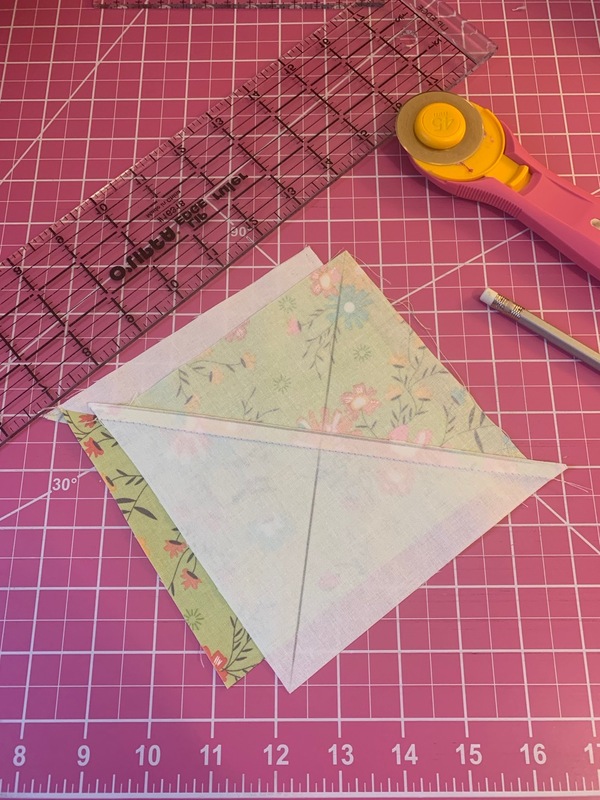 Press seam toward the border. 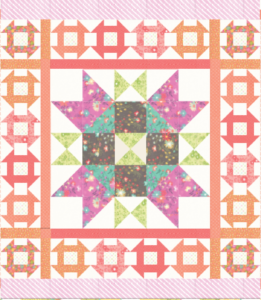 Sew one row of 7 Friendship Stars on each side of the quilt and press seams toward the border. Your quilt should measure 63 ½ inches square at this point. 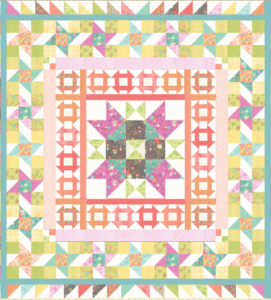 Sew one 63 ½ inch strip on the top and bottom of the quilt, press toward the border. Sew one 66 1/2 inch strip on each side of quilt and press toward the border. 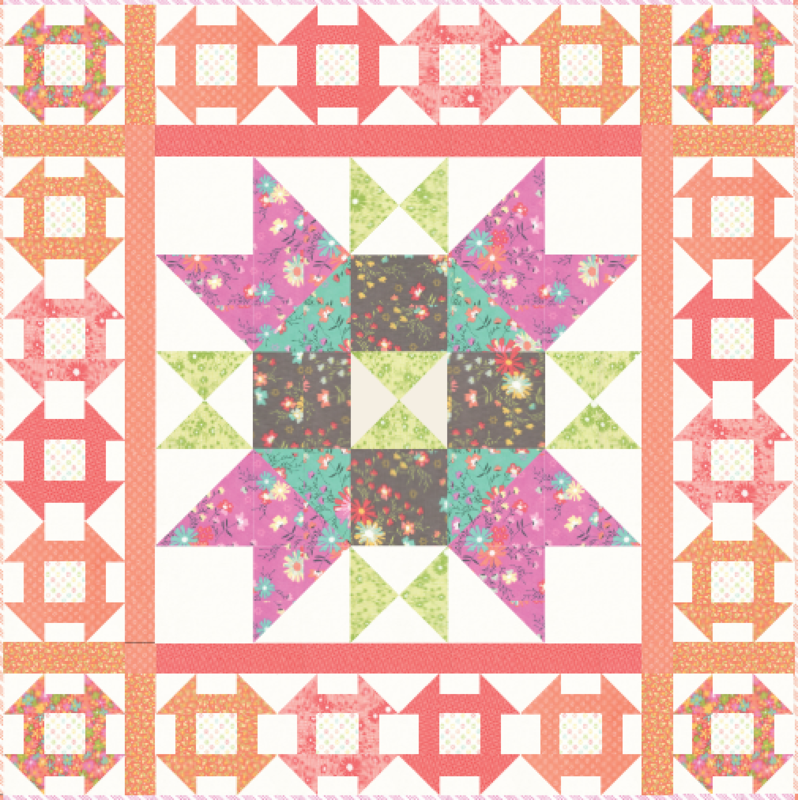 Your quilt should now measure 66 ½ inches square. 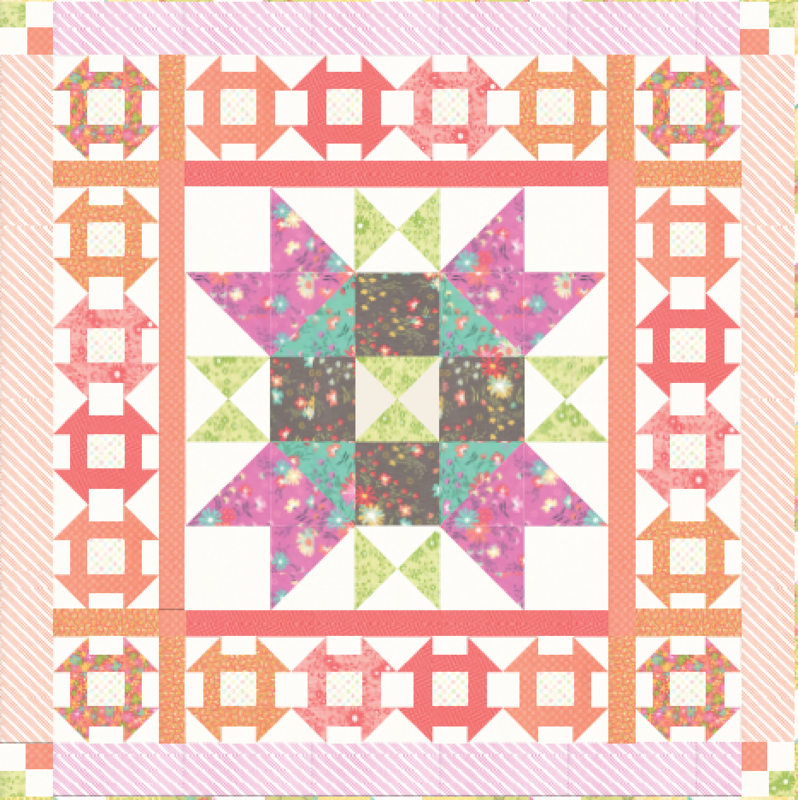 The scrappiness continues with this border made with 72 – 4 inch HST (finish at 3 ½ inch) and 4 – 4 inch (3 ½ finished) Four Patch Cornerstones. 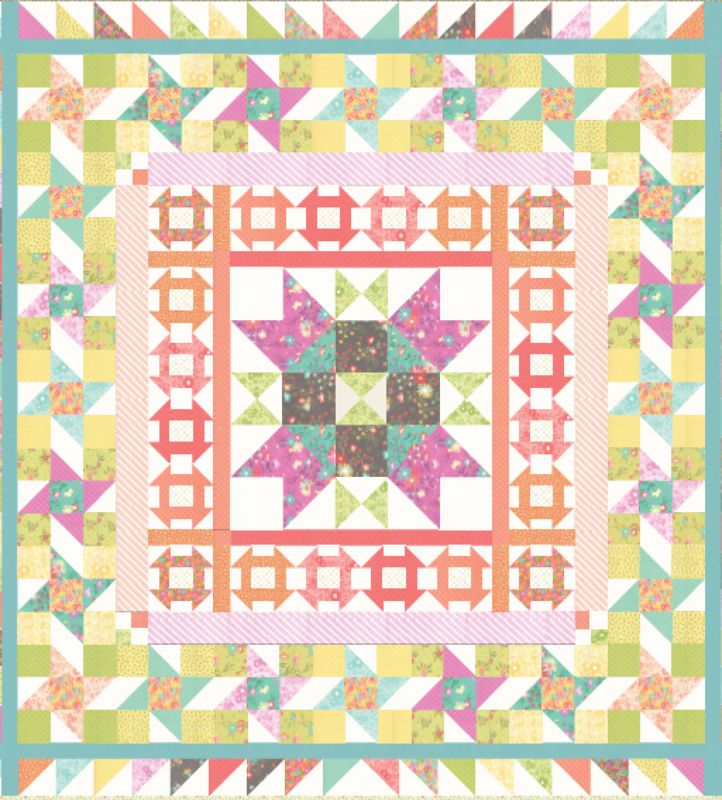 8 – 2 x 4 inch rectangles of the aqua fabrics used in the Third Border. 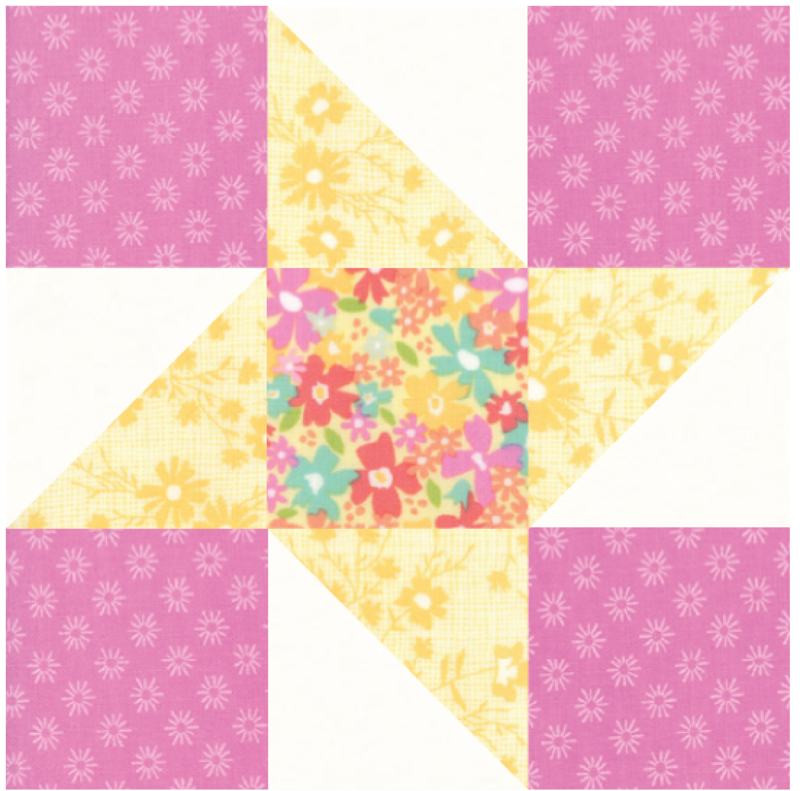 Make 72 HST with the 36 – 4 ½ inch squares of background fabric and 36 – 4 ½ inch squares of various prints. Make 4 – Four Patch Cornerstones. 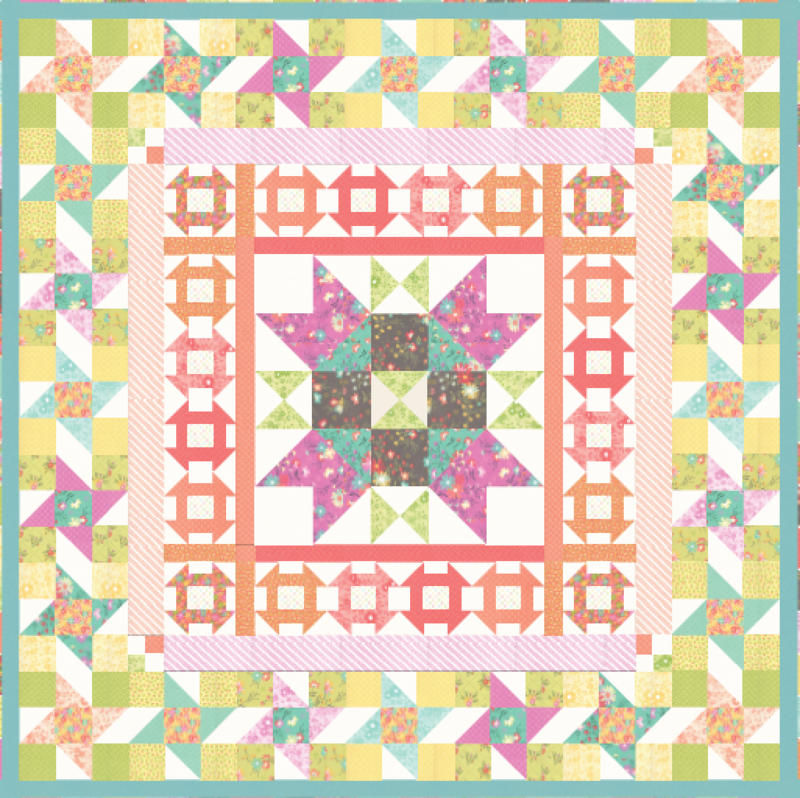 The quilt should now measure at 73 ½ inches square. 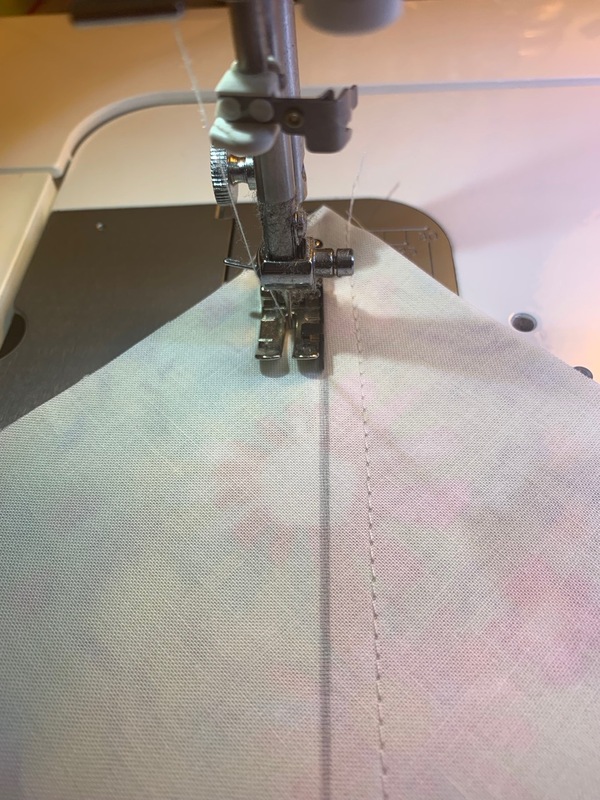 Sew one 73 ½ inch strip on the top and bottom of the quilt, press toward the border. 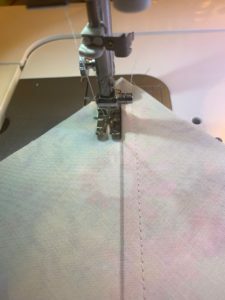 Sew one 76 1/2 inch strip on each side of quilt and press toward the border. 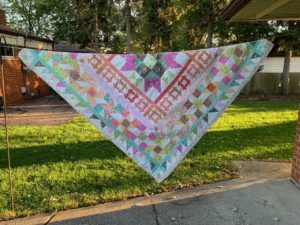 Quilt and bind as desired, then wash, dry and snuggle! 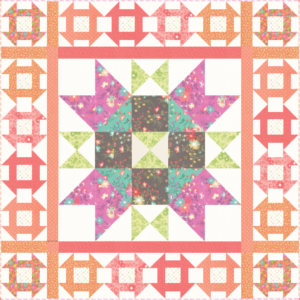 This quilt finishes at 76″ x 76″. 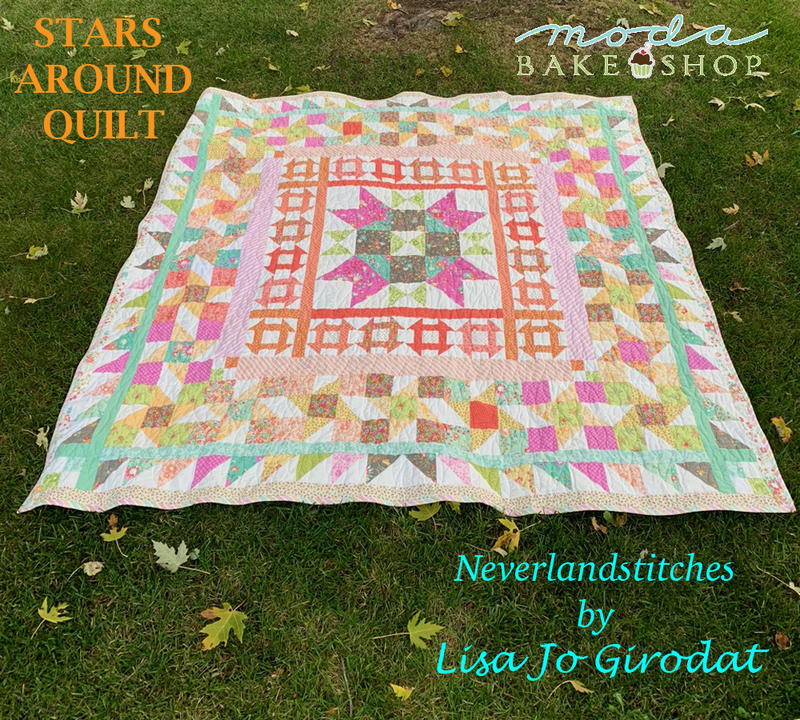 If you make my Stars Around quilt, please tag me on Instagram as I would love to see your version! 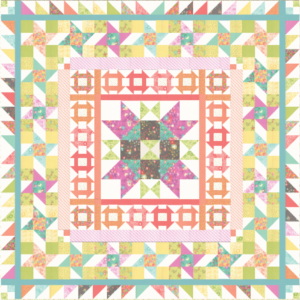 This entry was posted in Fat Quarter Bundle, Moderate, Quilt.